Just look at it. It’s wearing an ascot. Or a scarf. Whatever. 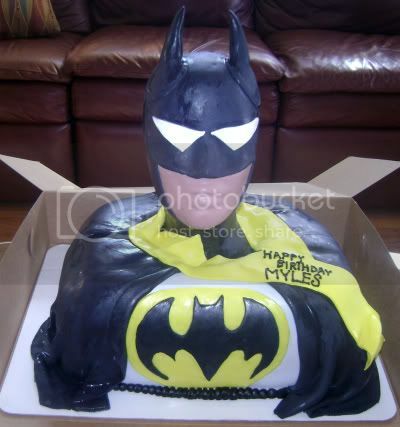 I made this batman cake for a friends birthday party this weekend. The cake is white with buttercreme frosting. Lots of hard work but it came out nice! Beware of Kimberly’s Web site, unless you enjoy completely-arbitrary animated butterfly GIFs with your Web-browsing experience. But, hey, if you’re into that sort of thing, you and 1997 go knock yourselves out. * Thanks to Paul of The Robot’s Pajamas for plucking the Rainbow Raider from obscurity to put him in this punchline, where he so clearly belongs. Oh man, that’s a way better super hero than I came up with. Way to go Paul! I kind of like Dandy Batman. He reminds me of one of those jalopy-driving youngsters in the 40’s and 50’s. Also, have you seen the blog at mydisguises.com? I was searching for costume blogs yesterday, and found that, and it seems to be right up your alley. I recommend you check it out (and this is unsolicited; I’m not affiliated, just a fan of costumes and superheroes).